This is the most uncomplicated recipe of a finger licking preserve made of raw mangoes. Tart raw mango slivers preserved in sugar syrup is what we know as aam ka chhunda or kasse aam ka khatta meetha achar. Small quantity of mango chhunda can be made in a microwave within minutes, including chopping/grating and cleaning the utensils. yes it is so uncomplicated. It has been almost 2 months since I made this aam ka chhunda and the mango loaf, both paired so well together that now I will always think of these two recipes together. I actually serve aam ka chhunda with everything and anything, from parathas to matthis, with multigrain breads or sandwiched between two digestive biscuits. You go by your imagination and you will never fail with mango chhunda. 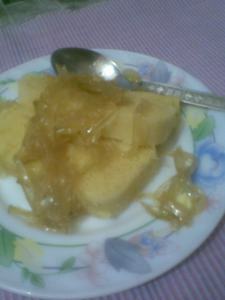 Even a plain aatte ka meetha cheela tastes really good with aam ka chhunda. To make it more versatile I keep the preserve mildly spiced. One can always add spices like saffron and cardamom or crushed fennel seeds, or a mixture of fenugreek, fennel and red chillies in the last stage of cooking when a stronger spice level is desired. I prefer flavoring the mango chhunda when needed accordingly, just sprinkle a pinch of required spices with a dash of water and microwave the quantity you need to use immediately, or cook in a small pan over gas stove, even the tadka pan works well. This way you can get any flavor as per choice or serve it plain with some strongly flavored dish. Like you can top the dhaniye wali matthi with a tbsp of plain chhunda. The preparation is simple s I mentioned, just grate the raw mangoes in a box grater or chop into thin slivers. You need about 800 gm of sugar or jaggery for a kilo of mangoes and 100 ml of water to start with. Mix it all well and wait for half an hour, till the mango slivers exude most of their water. Now heat this mixture on low flame and keep stirring. It takes about 40 minutes or more to get cooked. To know whether the chhunda is done, you have to lift the spatula above the cooking mixture, the same spatula you are using for stirring. When the sugar syrup falls in two thin streams, (a third stream is good to get if you want the preserve to be almost dry) it means your chhunda is ready. This is essential for its long term preservation (this is called do taar or teen taar ki chashni in Hindi). When you are making a small quantity to be consumed within a few days or to be kept in the fridge, the sugar syrup should fall in a single thin stream, your chhunda would be syrupy and thin. You know you can make the consistency as you like it. The light colored mango chhunda on the left is made with sugar, the peeled raw mango is chopped thinly in julienne and there is no spice used to flavor it.The dark colored mango chhunda on the right is made with jaggery, lightly spiced with a hint of red chilli and garam masala, the raw mangoes grated to make it a little homogeneous. Both the variants taste great and can be used differently. 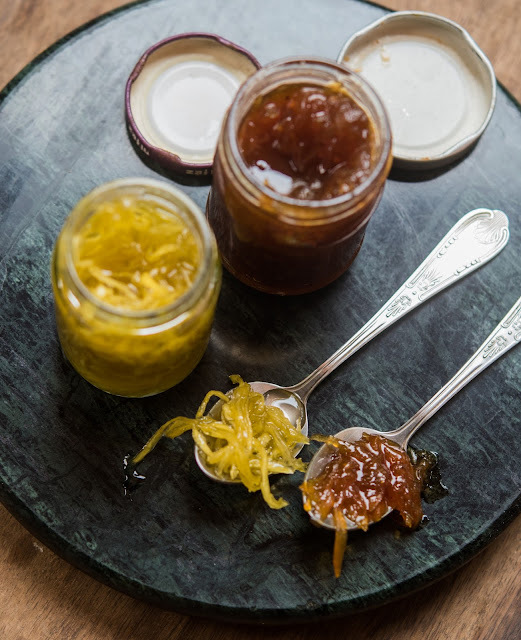 Gujratis call this relish as keri no chhundo and serve it with their bhakhris and theplas. Kachhe aam ka chhunda is an essential relish to be stocked for the whole year in many families. My mom used to make it when we were kids, obviously because it was in high demand. She doesn't make the chhunda anymore as all of us siblings have started making it and sharing our pickles and preserves too. 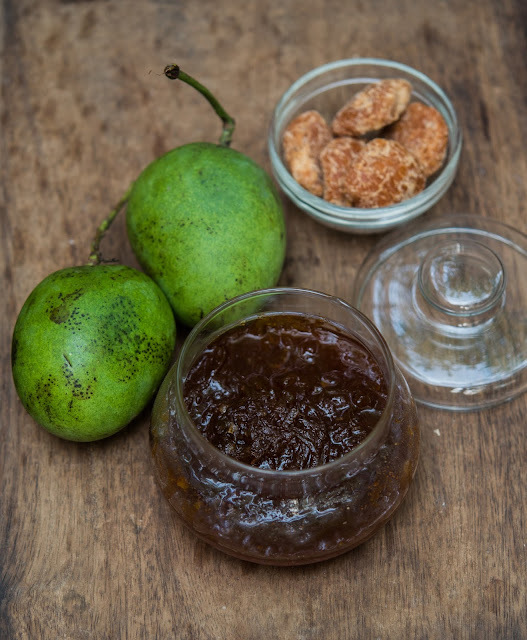 Make the aam ka chhunda and see how it flies off the pickle shelf. So glad to have this. Thanks for sharing!